Die Ausstellung Bempicolombo des Künstlerduos Eyrich von Motz eröffnet am 11. April 2018 in der MIRANDA KUO GALLERY in New York. Die Ausstellung kann bis zum 13. Mai 2018 besucht werden. „When Thomas Hirschhorn writes that the crystals stand for ‘the universal, the ultimate and the absolute’ he is arguing that the crystals stand for beauty itself. Here, in the work of Philipp Eyrich and Mateusz von Motz we are confronted by an idea of crystals that can best be described as a bling brutalism. Lumps of concrete are covered with shiny reflective film. The raw surface of the concrete – that reveals itself on the edges and sides of the stones – is animated by the shiny colored film that clings to the surface. The stones shimmer in response to the passing movement of the audience, they dance to any changes in light and with this dance encourage the objects around them to become animated. As with much of the work in the show, there is a collapsing of values. Crystal embody the lure associated with fools gold, we might also associate these glistening reflective stones with the type of souvenirs that adorn the shelves of older relatives, they occupy domestic spaces but lack any function apart from the value associated with the gift. The combination of concrete and brightly colored reflective film comes into being as an encounter with a singularity of that which is at once precious and valueless. Donald Judd in his essay ‘Specific Objects’ (1964) argues that painting with oils had reached its limit. 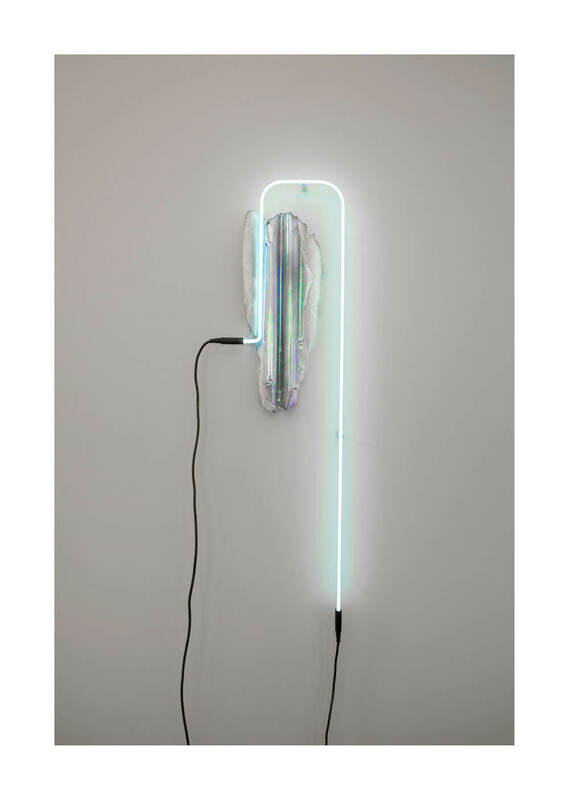 The colors and forms found in machine made objects, such as the shiny Harley-Davidson metallic day glo green or the putrid Perspex oranges that proliferate throughout Judd’s work from the 1960s, offered new possibilities for art. This combination of raw fabricated metals and shiny glimmering surfaces gives form to an art that is then carefully situated within architectural space.